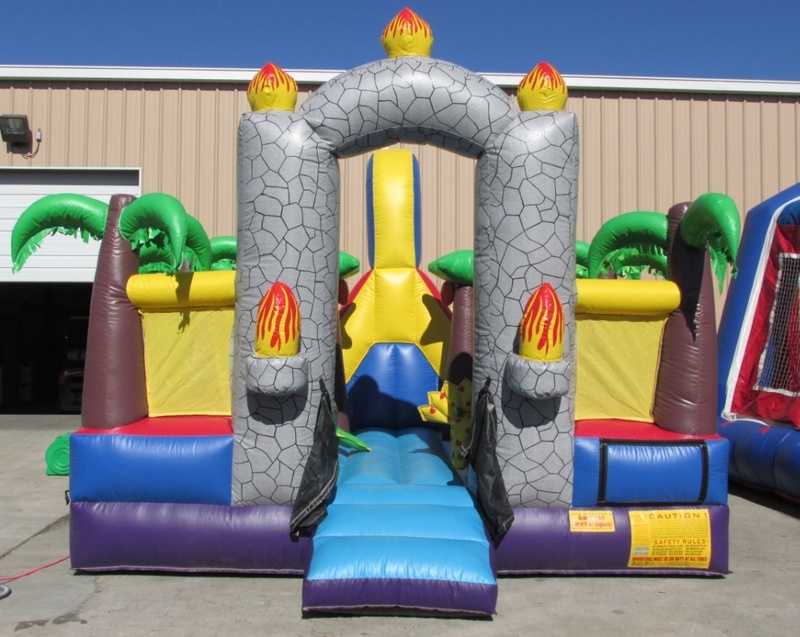 Whether it’s for a birthday, a grade school graduation, or just a Saturday play date, kids will be thrilled to bounce around as pterodactyls and triceratopses at an energetic summer bounce house party. 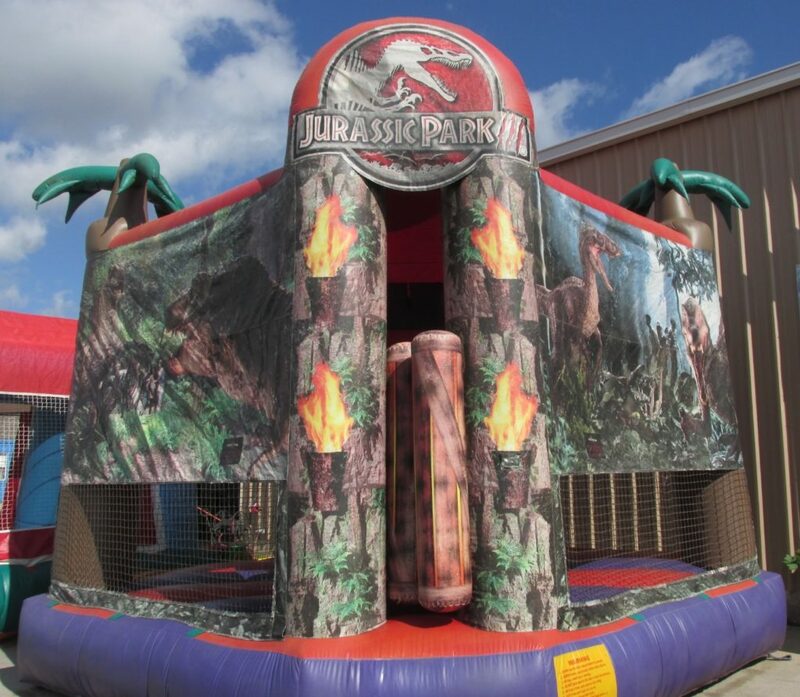 Planning a Jurassic Park bounce house party doesn’t have to be a beast. For the more ferocious party-goers, printable paper masks or face paint can awaken anyone’s inner dinosaur. Adventurers can make simple dinosaur plates out of construction paper or decorate their own dinosaur sugar cookies. Explorers can search for dinosaur eggs around the yard, filled with candy and toy dinosaurs, or even dig up fossils from a sandbox or pail. Regardless of what they play, children’s imaginations will run wild with the dinosaur theme, and bounce house parties are the best way to channel all of that youthful energy. What young explorer wouldn’t be thrilled to meet their dinosaurs face-to-face? The towering orange dinosaur bounce gives ample space for children to act out their imagined roles inside a giant, friendly dinosaur, playing games like tag and four corners. For the dedicated adventurers, the 3-in-1 and 4-in-1 Dino Combos will let explorers race, relay, and tag-team their way to victory at your next bounce house party. With towering gates, palm trees, and blazing fire, dinosaurs and adventurers alike will feel transported into Jurassic Park when they step into the Dino Zone, ready to take on the most terrible of t-rexes. 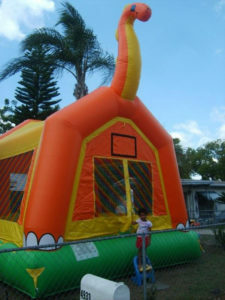 Bounce house parties are the best way to allow children to tap into their youthful imagination and make up their own stories, games, and dinosaur hunts to let out their inner adventurers. With the release of Jurassic World just around the corner, kids will want to fill their imaginations full of prehistoric fun. Add a movie screen to your rental and watch the classic originals under the stars after a day of bouncing fun. Just keep an eye out for wild Raptors!